(Newser) – The cursive is Bonnie's; the signature, Clyde's. 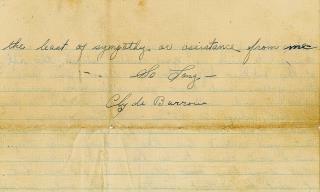 A four-page letter written by the duo in April 1934 is hitting the auction block in September, and it's a fiery one. It's addressed to one Raymond Hamilton, a one-time member of their gang who, at the time the letter was written, was behind bars in the Dallas County Jail. That he was there was a reflection of just how "yellow" he was, per the letter, as he didn't try to flee as he was captured. The Dallas Morning News reports the trio had a falling out over Hamilton's girlfriend (the "prostitute sweetheart" the letter refers to); the AP cites a disagreement over how to divvy up $4,000 they had taken from a Texas bank earlier that year. This after Clyde Barrow and Bonnie Parker famously rescued Hamilton and four others from a Texas prison farm in January 1934, per a New York Daily News article written that year. Hamilton was serving sentences totaling 262 years at the time. Idiot remarks about Bonnie killing people. She never shot anyone or shot at anyone even when Clyde yelled for her to do so. She shot one shot into the air. Yes Raymond Hamilton killed more than enough to get him the chair. The fact is Hamilton, Joe Plummer and Mary O'Dare murdered the Grapevine Patrolmen. Thank Sheriff Schmid for hiding the evidence pointing to them. Bonnie, Clyde and C.W. Methvin were long down the road on their way to MO. when these murders took place. Clyde never once went out to just start shooting someone. I'm going to assume Hamilton was electrocuted because even if he didn't kill anyone directly, Bonnie & Clyde did. "Sheriff Richard "Smoot" Schmid intercepted it and later publicized it; his family is now auctioning it off." THIS is totally illegal! He had no right "intercepting" and keeping something placed into the USMail! And NOW...his family will profit form his thievery!! This is all wrong!